These Real Estate Signs Offer Plenty of Ways to Get Attention! 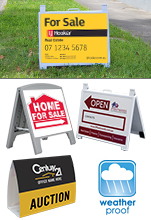 Real Estate Signs Offer Heaps of Ways to Promote! These real estate signs have plenty of options and styles to place outside of your business or in front of homes to help inform customers of sales and provide contact information. 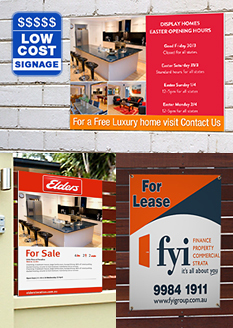 Lawn signs, auction signs, and other real estate signage make it easy to both promote to passersby as well as outfit your office space with quality displays to effectively interact with potential clients and customers. The realestate signs, auction signs have include displays made of different materials & offered in different finishes in order to best work with a variety of environments and decors. Using real estate signs at your location help to really garner interest from passersby, and provide important information to customers to bring home with them to be well informed before making buying decisions regarding your properties! The lawn sign frames offered are made from reinforced plastic to provide a strong display that will hold up well to rigors of daily use , even in different elements! There are many styles of these holders to choose from in order to best fit in with your needs, including sign stakes that are able to be directly inserted into the ground! The different displays are all lightweight to easily be moved into position by any person, and sold at inexpensive prices to make them affordable for every business. The lawn sign frames also includes stands made of the same durable plastic that are more suited for placing on the pavement outside of a location, or even on a path or sidewalk in front of a home. There is even an option for a window mounted sign display perfect for creating a driving advertisement display! A simple clip is held in place using the window to securely hold the frame in place. The materials used with all of these products are designed to me used outdoor in most conditions for versatile displays. Custom graphics may be created, made out of a variety of materials, for use with these displays. By using custom graphics, you can convey the exact message you wish whilst providing customers with the proper information to get in touch about properties. Each product page shows the requirements to meet for the size and thickness of your sign to ensure you make the proper choice when designing your advert. 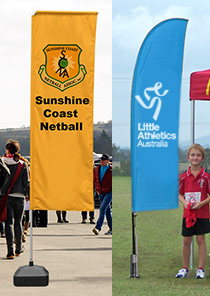 There are many corflute signs to choose from as well, all in different sizes for use both outside of properties and even on construction sites or around festivals as perfect temporary signage. The outdoor signs include many sizes to best fit in with the needs of businesses, from large formats that can show heaps of information, to smaller versions that are ideal for a quick warning or phone number to contact. Each printed promotional sign can be printed with your custom graphics on either one or both sides of the sign depending on your situation. The 5mm thick sign is made of premium corrugated corflute for durability and strength whilst on display. 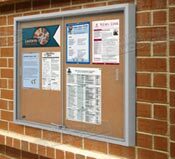 The commercial sign posters may also have metal eyelets placed on the boards to make mounting the displays easier using fishing lines, plastic ties, or chains. The versatile displays also are able to be used in either portrait or landscape orientation to provide your design team with creative freedom when creating your graphics. Offered at an inexpensive cost, these posters are great for many uses! 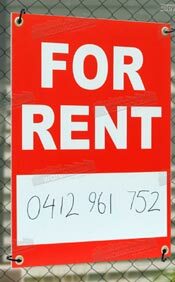 How are Real Estate Signs Utilised? 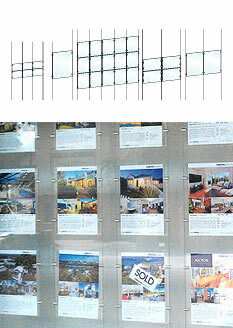 Another series of products offered for your business are window displays that are perfect for placement in your office to help entice customers with beautiful images of available properties. These window sign holders have heaps of options to choose from, with various sizes and configurations available to find the perfect fit for your windows. Sizes include A1 (841 x 594mm), A2 (594 x 420mm), A3 (420 x 297mm), & A4 (297 x 210mm) in order to better match how you wish to portray properties. For example, larger graphics are typically used by not only realestate agencies but also banks to show deals announce events, and promote upcoming specials in an eye-catching manner. Even travel agencies utilise these displays to help show the amazing destinations available around the world to travel to using their agents. These displays feature clear plastic holders that are side-loaded to make switching out graphics a fast and easy task with no tools needed, as button magnets securely hold the acrylic frame together without hindering view. The clear plastic is easy to clean, and helps to maintain a clean display by ensuring your graphics remain free of grime and dust. Brass standoffs with a satin silver finish firmly grip the acrylic frames, and attach to a cable, with each display coming with plenty of length of the cable to easily work with your store. There are both landscape and portrait options available with each size, making it easy to find the right one for your needs. All of the frames are double-sided as well, making it simple to promote to both passersby outside your business and give additional information to customers within your office! There are a large number of displays offered as well that help to outfit an office using traditional methods of advertising as well as harnessing the latest in technology to help create a memorable experience. TV stands and iPad displays are offered to make an interactive display within your walls that help to start the conversation with customers. TV stands can show properties on monitors to help potential clients get a better understanding of amenities and the location of the home or flat. There are different styles of TV stands that hold monitors ranging in size, with each product showing the compatible dimensions. There are wall mounts offered as well to place a TV against the wall in order to keep plenty of space for customers to walk around, place other displays, or even for agents to place their desks. 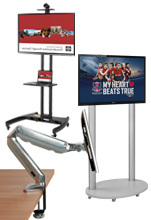 Portable television stands require no tools for assembly, and are perfect for creating a booth at different trade shows and conventions held in exhibition halls. Different finishes are offered to better fit in with your booth design as well! The different iPad stands include both floor standing and countertop options, making it easy to find the one that works best for your needs. 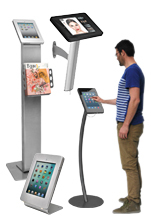 The different types of stands feature many lockable versions, giving piece of mind to businesses that the display is safe whilst on display and does not need a watchful eye, allowing employees to freely interact with customers. There are also different finishes offered with these displays to make it easy to match your décor, just like the TV stands. These metal stands are durable for use in heavily-trafficked areas without worry, providing long-lasting displays that can work for years and stand up to the rigors of consistent use. 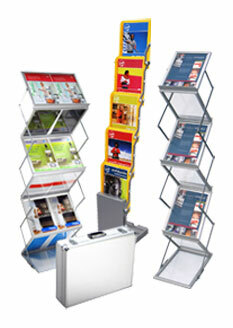 Some of the stands even utilise brochure holders in the front, perfect for placing take away information in. Also similar to the TV stands, there are wall mounted versions to hold your iPad in style along the wall whilst still being an easy to interact display for customers. 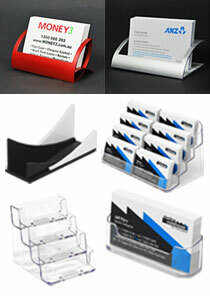 As mentioned above, there are also many traditional displays available to place around your office for customers to use. Many brochure holders are offered to place pamphlets, catalogues, and more in so that potential clients may bring information home with them to go over prior to making decisions. 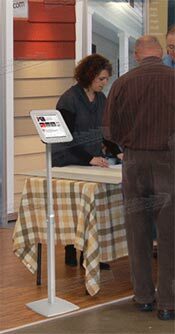 The different styles include many portable options that are easily moved into position both around the office and in trade show booths. There are aluminium stands that are perfect for every day use, as well as a selection of mesh pocket holders that may be brought to exhibition halls easily to provide company information. Able to hold many different sizes of brochures, these are a truly effective display in providing pamphlets for clients to bring home with them. 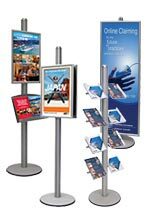 There are also many poster & brochure combination displays available that allow you to create the right display for your needs. These modular units have many accessories and options in how to create the display to best fit with the needs of your location. Creating a double-sided display helps to promote in multiple directions at once without taking up addition floor space to leave plenty of room for moving around. There are different sizes of stands available to work in various settings, helping you to find the right one to outfit your business. 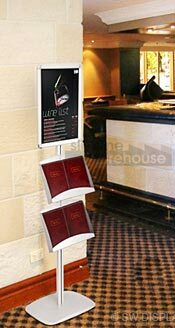 Brochure holders available for these displays include aluminium and acrylic makes, with sizes able to handle both brochures and catalogues with ease. Many business card holders are offered as well, with different makes, finishes, and styles offered to be placed on your desk to give clients your contact information to help complete the sale. There are also large business card displays that can hold multiple cards, letting you reach out to local businesses to have their information readily available in your location in exchange for the same courtesy at their location. A variety of whiteboard displays are also offered in addition to the lawn sign frames that help to garnet attention outside of a for sale home, helping to complete the interior of your office. From wall mounted versions to floor stands, heaps of styles are on offer. 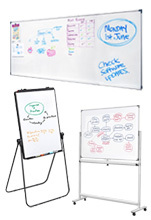 The dry erase boards include different magnetic displays that can have posters, graphics, and notices posted in addition to being writable. 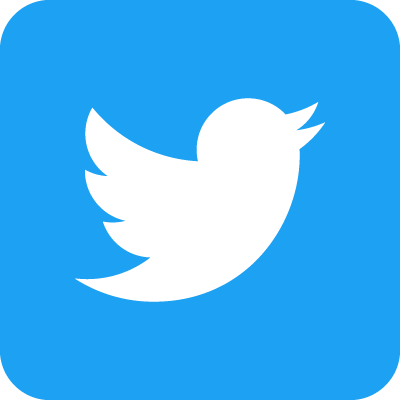 This is especially useful in real estate offices that train new realtors regularly and wish to make ti easy to impart information to clients regarding mortgage rates and the like. 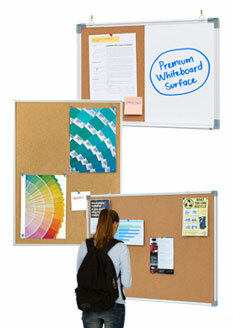 The wall mounted versions also includes combination boards that feature a corkboard side for placing notices on while providing ample space on the markerboard to inscribe messages. Hardware is included for wall mounting as well, making installation easy. If unsure the included hardware is appropriate for your wall surface types, please consult with a professional prior to installation. There are many standard corkboards to choose from as well, all with a self-healing cork surface that replenishes over time to offer a long-lasting display that works for years to come. 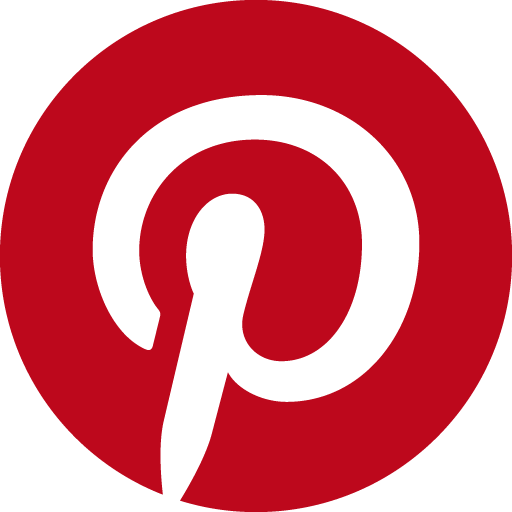 The corkboards are accepting of tacks, staples, and push-pin to hold up notices in any location. There are many sizes to choose from as well, from smaller versions that can be used in realtor cubicles to huge frames that are perfect for placing in office lobbies, break rooms, and conference rooms. Some of these displays also include sliding doors that are lockable, ideal for placement in public areas to help ensure case contents are safe from tampering. The lockable displays have mounting hardware included similar the mentioned white & combination boards, with the same warning of checking about wall surface types if unsure. The sliding doors are made of tempered glass to be shatter-resistant, and if they do break will be in small pieces instead of larger shards like standard glass. Handles are etched into the glass as well, helping to make opening and closing the case simple without leaving unsightly marks on the front panels. The aluminium frames are hard-wearing for use in heavily trafficked areas and years of use with little worry of breakdown. With so many options in how to display your realestate information, our vast selection makes it easy to create the right display at your business to help garner the most attention. Our extensive online catalogue features a huge range of different products, making it easy to find the proper items that will help garner attention at your business. The wide variety currently available make it easy to purchase everything you need to outfit your business from one location, helping to save on shipping costs and giving you the piece of mind that your shop will be outfitted with top quality products. New items are added to our selection weekly, helping you to stay ahead of the competition with the latest trends, styles, & technologies. There are many types of products for you to choose from, conveniently broken down into categories to make it easier to browse and find the display that will help your business reach out to more customers. 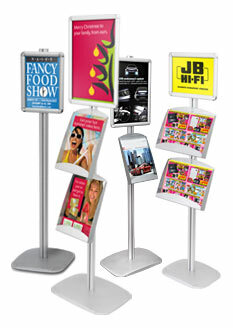 Check out all the lecterns, TV displays, poster stands, hanging hardware, stanchions, business card holders, photo frames, cafe barriers, pull up banners, portable counters, exhibition displays, cigarette bins, brochure displays, event flags, notice boards, easels, lightboxes, POS signs, and many more! Slimline Warehouse has been a national leader of POS, POP, retail, & exhibition products, with over 20 years experience in the business. We source our products from vendors locally & around the world to offer the highest quality products to our customers at low prices that can't be found anywhere else. All products are thoroughly inspected by our quality assurance team, providing our customers with only long-lasting products that will work in your business, even in heavily-trafficked areas, for years to come. Our warehouse provides same day despatch with most in stock products to anywhere in Australia with purchases made prior to 1pm EST. Order today for your business in Hobart, Darwin, Perth, Cairns, Canberra, Gold Coast, Bendigo, Brisbane, Adelaide, Sydney, Newcastle, Melbourne, Toowoomba, & Alice Springs!